the Boston market remained small in December and prices declined slightly. 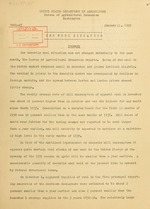 ly high level in the early months of 1939.
offset by the decline in production in Australia and by larger exports. Hemisphere is more favorable than at the beginning of the season. the 1938 seon a5 ?-..' ,5 percent lower than in April 1937.
has been little recovery in foreign wool prices in this p'-riod. ',ool1 sales in the Boston market wore relatively small in recer.ber. markets, but few lots were offered at this price. pounds for the 5 years 1932-36.
smallest for those months in any recent year except 1932.
as a result of the large mill consumption and small imports in recent months. the end of :Iovc-r.bor were estimated to have been larger than a year earlier. Government wool loans, which were made available beginning April 15, 1938.
million pounds had been released by ropaynrcnt of loans. Imports from the Bur. :Lu of Foreign and Domestic Commerce. Consumption Fror., the Lurcau of the Census. 3/ Production for entire year. cent smaller than in the same months of 1937.
was 60 million ':unds smaller than consumption in the same months of 1937.
there is some rise in foreign prices in terms of United States dollars. prices, and the spread between -Doton and London :-ricos showed little change. lo.rer than at the close of the previous series on September 30. July to November were about 18 percent larger than in the same months of 1937.
average quality wools, declined slightly in November. before the markets closed for the holidays. as of D--c.:-.' r 1 in the 5 years 1932-36.
well as the 5-year average. 2/ Estimates of Dalgcty and Company. : 197 : 1_9_7 : 1937 : Oct. : Nov. : Lee. Foreign prices have been converted at prevailing rates of exchange. price which is a weighted av-.rage. 4/ Reports of the ..ational Council of Wool Sellin. Brokers. '6/ 7-month avrcge. '.o quotations April to August. 7/ 8-month average. :No quotations May to Au:u:st.
8/ South African Ministry for Agriculture. 9/ 10-month average. No quotations July and August. Pre'ios Salaberry Bercetche & Cia. 11/ 10-month average. No quotations Au'iust ar.d Sctczmb.r. 12/ 4-month average. ;1o quotations April" to .overbcr. 13/ Boletin de Hacienda, Uruguay. 14/ 6-month av~rare. No. quotations May to October. 15/ Scour,:d basis at F.ostor..
16/ Av-:-r- at 10 markets. 17/ 78 percent white at LA. York-Bureau of Labor Statistics. ID./ Eural'u of Labor Statistics. Commerce, Consumption and Machinery Activity from the Bureau of the Census. 1/ Weight of greasy, scoured and skin wool added together. November on 48 weeks. No adjustment made for holidays.